Encarsia formosa is more effective against GWF (Trialeurodes vaporariorum), but also provides some control against Bemisia. 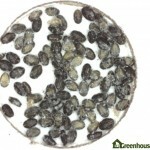 Encarsia is one of the most widely used natural enemies in greenhouse production. First observed naturally on whiteflies in tomatoes in England in the 1920s, it was produced commercially for a number of years afterwards. Use discontinued with the advent of synthetic pesticides in the 1940s, but as resistance developed in GWF1 production was resumed in the 1970’s. Adult Encarsia (Figure 1) are about 0.6 mm long, and have a black head and thorax and yellow abdomen. 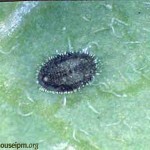 Parasitized GWF, turn black as the wasp inside it pupates (Figure 2). This change makes establishment of Encarsia very obvious. Parasitized Bemisia are less obvious, turning a tan to brown colour (Figure 3). 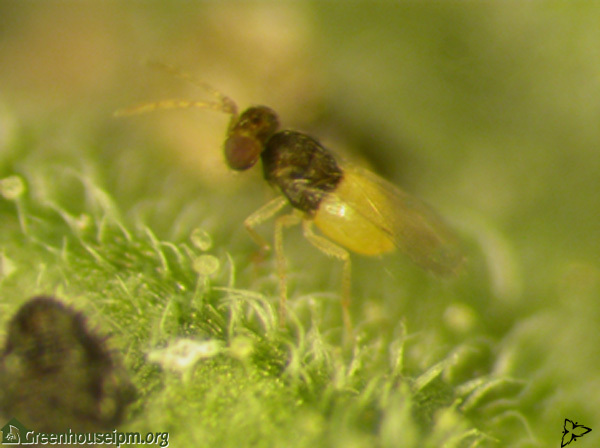 E. formosa is a parasitoid; a parasitic wasp that kills whiteflies by laying eggs into the immature stages (death occurs as the wasp develops inside the whitefly) or by directly feeding on the young whitefly nymphs (host feeding) (Figure 4). 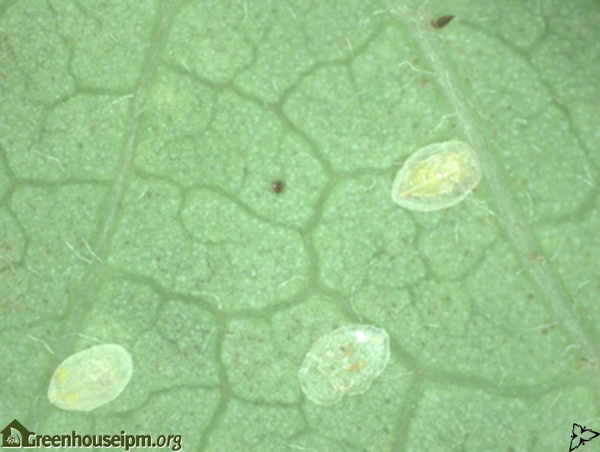 Although eggs can be laid in any of the whitefly nymphal stages, the 3rd and 4th stages are preferred. 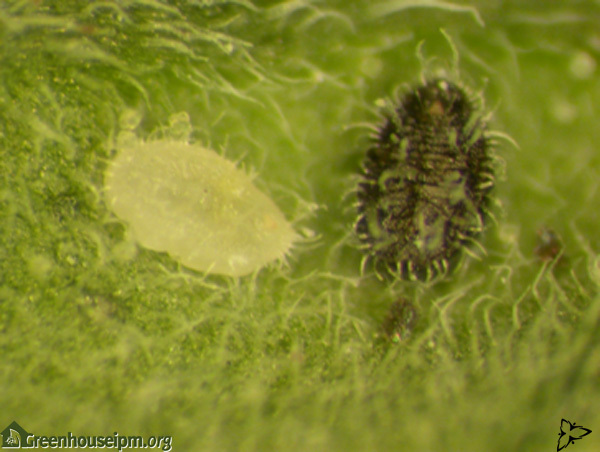 However, the wasp larva can only pupate when the immature whitefly reaches the 4th instar2. Adult Encarsia can live for a few days (at temperatures above 30oC) to a month or longer (at temperatures below 20oC). Almost all Encarsia are female and they can lay up to several hundred eggs during their lifetime depending on temperature and food availability2,3. 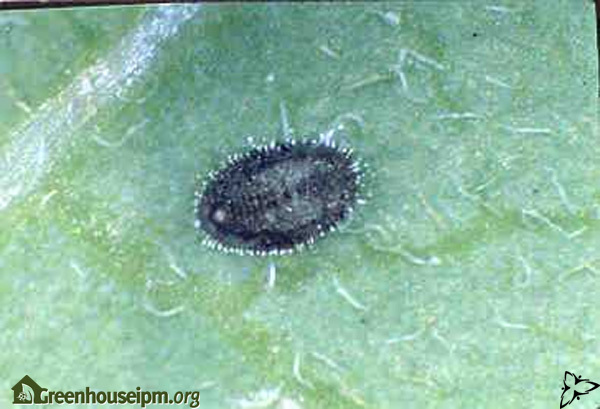 Developmental time of the immature Encarsia is affected by temperature, whitefly species and the host plant on which the whitefly is feeding. For example, development time can increase by 22% when Bemisia is used as a host, compared to GWF. Likewise, development in GWF on vegetable crops is approximately 15 days, compared to 24.5 days in GWF on poinsettia4. 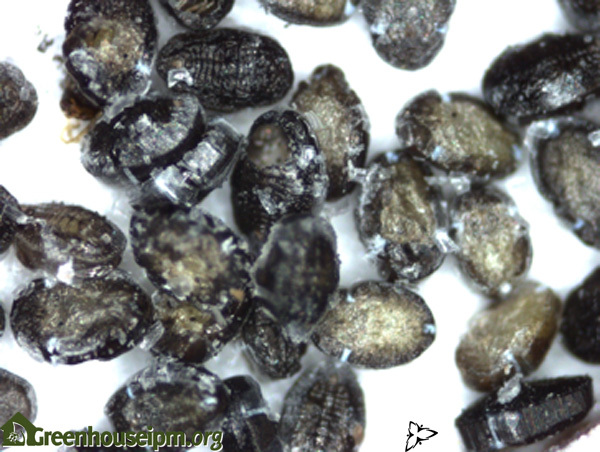 A parasitized GWF turns black (Figure 5) 10-14 days after being parasitized. On average, another 2 weeks are needed before the adult wasp emerges. When the adult is fully developed, it cuts an opening in the top portion of the black scale leaving a round exit hole in the empty pupal case (Figure 6) – which is still obviously black. Parasitism by Encarsia of Bemisia is not as effective as in GWF. Parasitized Bemisia turn a tan to brown colour (Figure 7) and are not as easily noticeable as parasitized GWF. 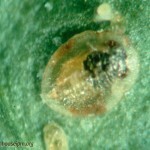 For biological control of Bemisia, Eretmocerus is a better option. 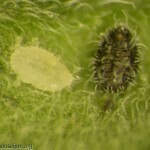 Whiteflies that have been parasitized are not used for host feeding, and likewise Encarsia will not lay eggs in whiteflies where host feeding has occurred4. Encarsia searching behaviour appears to involve random searches. 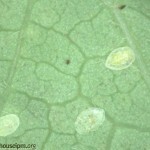 Whitefly hosts are located as the wasp walks across a leaf surface. The search can be slowed down by a number of factors including the hairiness of the leaves, leaf veins and large quantities of honeydew4. 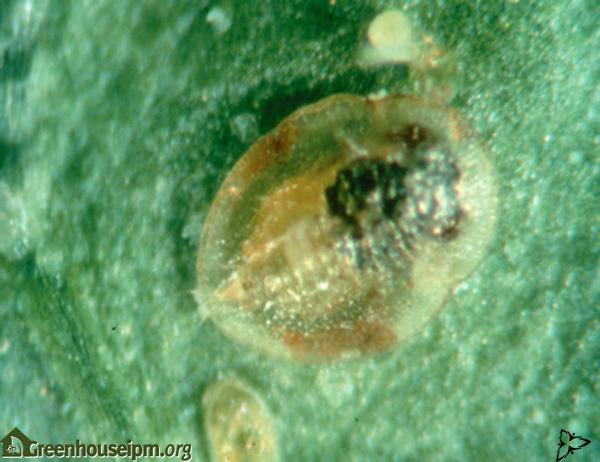 Encarsia parasitizes significantly more whitefly during summer conditions than winter5. Encarsia is supplied/packaged in several different ways. 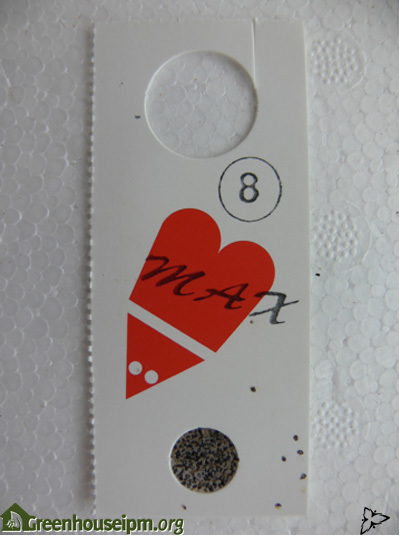 Most commonly, parasitized GWF pupae are stuck onto small cardboard tags (Figure 8) that are hung on plants throughout the greenhouse. The number of parasitized whitefly on each tag varies depending on the biocontrol producer, but is usually between 30-100. Some companies also sell products which combine both E. formosa and E. eremicus. 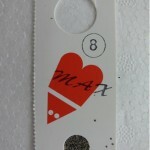 These are sold as parasitized GWF pupae on tags as described above, or as loose parasitized pupae. Refer to the Grower Guide: quality assurance of biocontrol products to determine the quality of the Encarsia at receipt at the greenhouse. 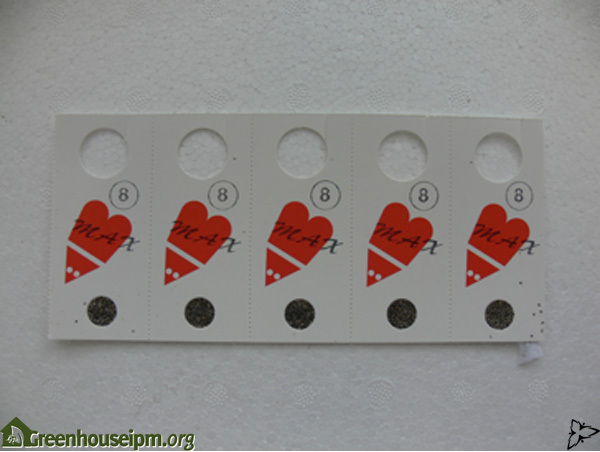 Tags should be torn off the strips at the perforations, taking care not to touch the actual parasitized whitefly pupae that are on them (Figure 9). They are very easily damaged. Encarsia on tags should be hung in the crop out of direct sunlight. In vegetables they should be 75 cm -1 m below the head of the plant image. In ornamentals they should be in the canopy of the crop (Figure 10). They should be distributed evenly throughout the crop. They are not strong fliers so the more release points in the crop, the better. 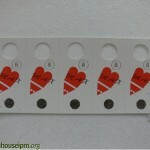 For that reason, some producers offer tags with fewer number of Encarsia on them, and these are distributed at a higher density within the crop. Loose Encarsia should be sprinkled on the leaves of plants or placed in small emergence boxes that are placed within the crop. Optimum environmental conditions for Encarsia are temperatures >20oC, humidity between 50-70% and high light. As such it is a much more effective natural enemy during summer months than in winter. Producers recommend releasing Encarsia as soon as possible after receipt. If it must be stored, it should be for a maximum of 1-2 days at 5-10oC. There is probably more information on introduction rates for Encarsia than any other BCA, reflecting its long history of use in greenhouse crops, especially in vegetables. Major producers have provided a number of recommendations based on different factors; e.g. 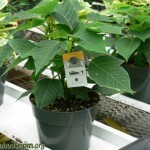 the crop, whitefly levels on the plants and on sticky cards, and the packaging product. Some recommendations are based on number of tags per m2 (e.g. 1 card of 60 Encarsia per 120 m2 until whiteflies appear, and then increasing to 1 card per 20-60 m2). Others are based on number of individual Encarsia per m2 or per plant (e.g. 1.5-3 Encarsia/m2 for preventative use up to 9/m2 for heavy populations; or 1-5 Encarsia/infested plant). Recommendations are provided for each of the major vegetable crops with one producer suggesting 3 times as many for preventative control in tomatoes and cucumbers as in peppers and eggplants. Several producers note that introductions should continue until at least 80% (or 90% in one case) of whitefly are parasitized. Shipments of Encarsia should be checked when they arrive to ensure they are live and healthy and that emergence rates are satisfactory. Encarsia tags can be placed in a glass jar with mesh over the top and the adults can be counted as they emerge over time. Most Encarsia should have emerged within 10-14 days. It can help to stick the Encarsia tag to a yellow sticky card so that as wasps emerge and fly that will be caught on the card, making it easier to count. 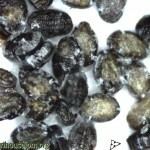 Alternatively, parasitized pupae on the cards can be counted (using a microscope or hand lens) 10-14 days after putting them in the crop, to determine how many Encarsia have emerged (Figure 11). This may give a better indication of what is actually happening in the crop as opposed to a jar in the office. Because of the distinctive discolouration of GWF that have been parasitized by Encarsia, monitoring in the crop is relatively easy. 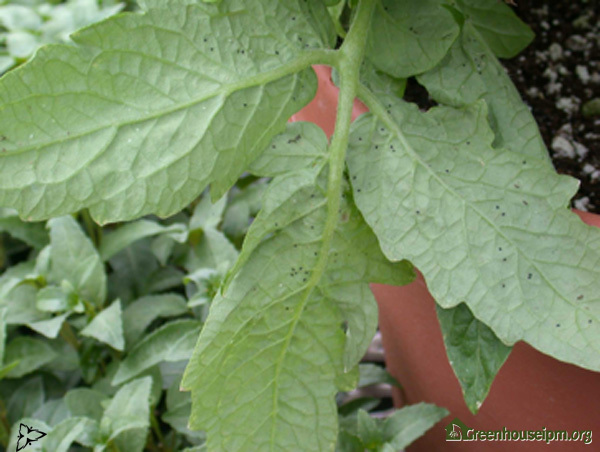 Turn the leaves over especially in known areas of infestation and check for black whitefly pupae (Figure 12). Several producers note that introductions should continue until at least 80% (or 90% in one case) of whitefly are parasitized. In ornamental crops, Encarsia is often used on gerbera, where GWF is the most common whitefly pest (at least in Canada). In such situations however, it is often used in combination with other BCA’s such as Eretmocerus and/or Delphastus. 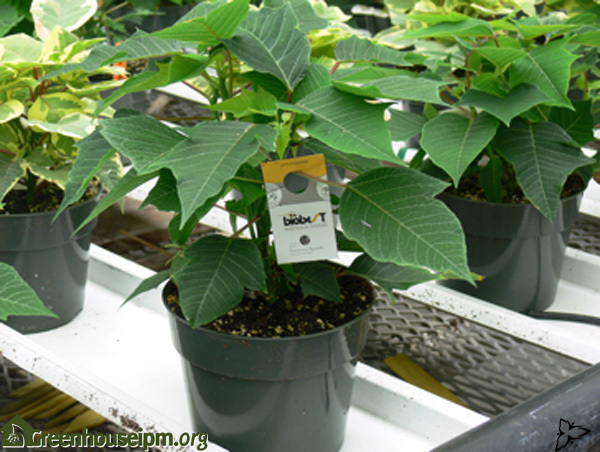 In poinsettia, where whitefly is the major pest problem, it is usually Bemisia which is found, so Encarsia has less of a role. 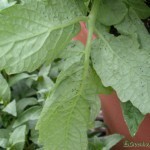 In tomatoes, note that deleafing practices can remove parasitized whitefly before the Encarsia has emerged. Many growers will leave removed leaves on the ground to allow the wasps to emerge. However this can encourage build up of Botrytis inoculum in the greenhouse. 1Malais M.H, Ravensberg W.J. 2003. 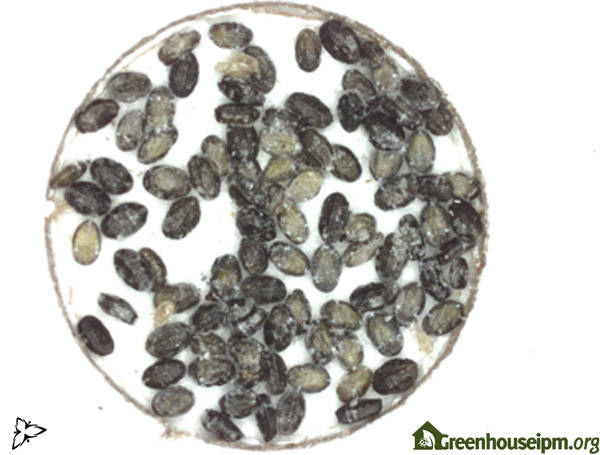 In Knowing and Recognizing: The biology of glasshouse pests and their natural enemies. Koppert BV, Berkel en Rodenrijs, The Netherlands and Reed Business Information, Doetinchem, The Netherlands. 3Arakawa R. 1982. Reproductive capacity and amount of host-feeding of Encarsia formosa Gahan (Hymenoptera: Aphelinidae). Z. ang. Ent. 93: 175-182. 4Hoddle M.S., Van Driesche R.G., Sanderson J.P. 1998. Biology and use of the whitefly parasitoid, Encarsia formosa. Annual Review of Entomology, 43: 645-669. 5Zilahi-Balogh G.M.G., Shipp J.L., Cloutier C., Brodeur, J. 2006. Influence of light intensity, photoperiod and temperature on the efficacy of two aphelinid parasitoids of the greenhouse whitefly. Environmental Entomology 35(3): 581-589. Enkegaard A. 1993. Encarsia formosa parasitizing the poinsettia-strain of the cotton whitefly, Bemisia tabaci on poinsettia: bionomics in relation to temperature. Entomologia Experimentalis et Applicata, 69: 251-261. Enkegaard A. 1994. Temperature dependent functional response of Encarsia formosa parasitizing the poinsettia-strain of the cotton whitefly, Bemisia tabaci on poinsettia. Entomologia Experimentalis et Applicata. 73: 19-29. Hoddle M., Van Driesche R., Sanderson J. 1997. Biological control of Bemisia argentifolii (Homoptera: Aleyrodidae) on poinsettia with inundative releases of Encarsia formosa (Hymnoptera: Aphelinidae): Are higher release rates necessarily better? Biological Control, 10: 166-179. Hoddle M.S., Van Driesche R.G. 1996. Evaluation of Encarsia formosa (Hymenoptera: Aphelinidae) to control Bemisia argentifolii (Homoptera: Aleyrodidae) on poinsettia (Euphorbia pulcherrima): a lifetable analysis. Florida Entomologist, 79(1): 1-12. Li Zhao Hua, Lammes F., van Lenteren J.C., Huisman P.W.T., van Vianen A., de Ponti O.M.B. 1987. The parasite-host relationship between Encarsia formosa Gahan (Hymenoptera: Aphelinidae) and Trialeurodes vaporariorum (Westwood) (Homoptera: Aleyrodidae), XXV Influence of leaf structure on the searching activity of Encarsia formosa. J. Appl. Ent. 104: 297-304. Stacey D.L. 1977. ‘Banker plant’ production of Encarsia formosa Gahan and its use in the control of glasshouse whitefly on tomatoes. Plant Pathology, 26: 63-66. Van Dreische R.G., Hoddle M.S., Roy S., Lyon S., Sanderson J.P. 2001. Effect of parasitoid release pattern on whitefly (Homoptera: Aleyrodidae) control in commercial poinsettia. Florida Entomologist, 84(1): 63-69.
van Lenteren J.C., van Vianen A., Gast H.F., Kortenhoff A. 1987. The parasite-host relationship between Encarsia formosa Gahan (Hymenoptera: Aphelinidae) and Trialeurodes vaporariorum (Westwood) (Homoptera: Aleyrodidae). J. Appl. Ent. 103: 69-84.
van Lenteren J.C., van Roermund H. J. W., Sütterlin S. 1993. Biological control of greenhouse whitefly (Trialeurodes vaporariorum) with the parasitoid Encarsia formosa: How does it work? Biological Control, 6: 1-10.